The aftermath of the January 8 shooting spree in Tucson dominated the American news media last week in a way events rarely do: the tragedy registered as the third-biggest story in a single week since PEJ began tracking coverage in January 2007. 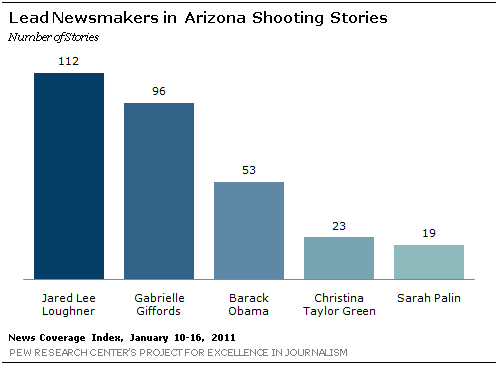 From January10-16, the rampage that killed six and badly wounded Congresswoman Gabrielle Giffords accounted for 57% of the news coverage studied by the Pew Research Center’s Project for Excellence in Journalism. In the past four years, only two stories—both about the 2008 election—generated more attention. The first was the nomination of Barack Obama and John McCain’s surprise selection of running mate Sarah Palin (69% from August 25-September 1). The second was the following week, September 1-7, when the Republicans held their national convention (58%). Aside from the sheer volume of media attention, what have the traumatic events in Tucson meant, as transmitted in the media narrative? This special report, combining PEJ’s weekly News Coverage Index with social media analysis technology from Crimson Hexagon, finds several key elements emerging. The Argument over Political Rhetoric was the No. 1 Storyline in the Tucson Coverage. The single biggest shooting-related topic involved a discussion of the tenor of political discourse in America, including its role as a potential catalyst for the tragedy. That theme proved to be the biggest component of the coverage both in mainstream and social media alike. According to the PEJ’s News Coverage Index, which focuses on the mainstream press, the often-heated debate about public discourse accounted for more than a quarter (27%) of all coverage devoted to the shootings last week. That was more than the coverage about the alleged shooter, Jared Loughner and his family (20%), the No. 2 Tucson storyline. And it more than doubled the coverage devoted to the third-biggest narrative, straight news accounts of the shooting and its aftermath, at 12%. Nowhere in the mainstream media did that debate echo more loudly than on the ideological talk shows on radio and cable news. 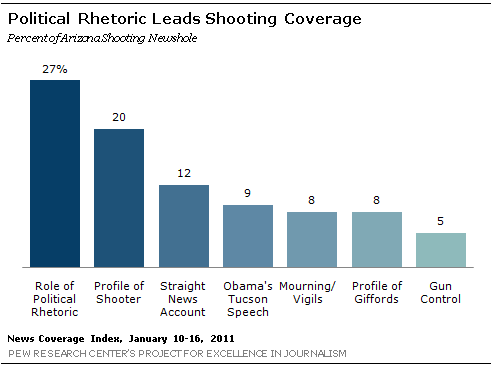 On radio, which includes commercial talk hosts, headlines and NPR, it filled 57% of the airtime devoted to the shooting. On cable, which includes prime-time and some daytime programming, it filled 32%. Some conservative hosts accused the left of trying to smear the right by suggesting that heated political rhetoric was somehow responsible for the violence in Tucson. The topic of political discourse was less prominent elsewhere in the media. 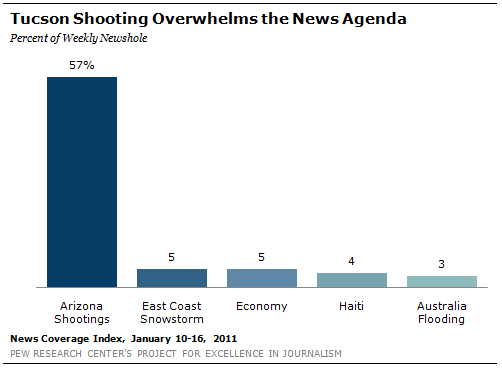 It accounted for 21% of the online news studied concerning the shooting. And it filled 18% of the front-page newspaper coverage devoted to the shooting and 18% in network morning and evening news on the story. But the tone of public discourse was a more significant focus of the discussion in new media. According to a Crimson Hexagon analysis that began two days earlier than the NCI data (on January 8), 29% of the conversation about the Giffords story measured on blogs and Twitter focused on public discourse. Crimson Hexagon technology analyzes online media by identifying statistical patterns in the words used to express opinions on different topics. Using Crimson Hexagon, PEJ was also able to analyze the tone of this conversation. Here, considerably more of the discussion about political rhetoric featured the left blaming the right rather than the other way around. According to the analysis from January 8-16, a full 59% of the commentary in blogs, Twitter and social media involved liberals blaming conservatives for their tone. That was more than twice the amount of the discussion—28%—that involved conservatives criticizing the left or defending themselves. Though smaller in number, some conservatives did fire back. “Sorry, but can’t let Left MSM lie, smear, frame the debate, set their memes unopposed,” tweeted Barbara McMahon. In social media, the subject of public debate was followed closely by a discussion of the shooting incident itself, the aftermath, and the media’s coverage of it. That filled 27% of the social media conversation. The No. 3 topic in social media was Obama’s response to the incident, including his January 12 speech and the memorial service to the victims (22%). Obama’s Speech Helped Cool the Debate over Angry Words—to a Degree. The speech, and the reaction to it, proved to be significant newsmakers. In the mainstream press, that accounted for 9% of the coverage devoted to the shooting story for the week, making it the No. 4 storyline. It was a bigger story in social media, where the president’s role, his speech and the memorial service accounted for 22% of the conversation. It will take time to determine whether the president succeeding in helping douse the heated rhetoric and fiery partisanship in Washington. At least some observers thought it had brought a temporary halt to hostilities. “I think it does end the episode we’ve had for the last three or four days of this rancorous, and I think, malicious debate,” ventured Krauthammer. That may have been a little optimistic. In the mainstream media, Obama’s speech halted the focus on the nature of political discourse for just one day. The day following his speech, the issue of rhetoric dropped to 11% of the Tucson coverage, while attention to his speech accounted for 31%. But by the next day, January 14, the public discourse discussion had once again emerged as the top storyline (21%) while coverage of Obama’s speech plunged to 3% of the newshole. But reaction to the memorial service and president’s appeal did seem to have more staying power in social media. It filled 32% of the social media conversation the day after he spoke and between 24% and 27% for the rest of the week. That was enough to push the focus on political rhetoric down from as high as 39% earlier in the week to between 24% and 28% the rest of the week. Almost as soon as news of the January 8 shooting surfaced, former GOP vice-presidential candidate Sarah Palin was drawn into the narrative. At first, that was largely by critics who blamed her—and her now famous map with its crosshairs imposed over Giffords’ district—as contributing factors to the violence. Palin entered the story more actively on January 12, the morning of the President’s speech, when she released a video that accused her critics of a “blood libel,” a controversial term that invoked the anti-Semitic charge that Jews used the blood of Christian children as part of religious practice. And in both the mainstream media and the online conversation, much of Palin’s coverage was unflattering. The Crimson Hexagon analysis shows that from January 8-16, bloggers and Twitter users were considerably more critical than supportive of her—by almost a 3-1 margin. Indeed, 58% of the social media commentary that involved Palin was negative, compared with 21% positive and 21% neutral. And a substantial portion of that was fueled by the response to her “blood libel” video. “Of course Palin is going to say something ridiculously offense like ‘blood libel’—this is how she stays rich and famous,” tweeted Maia Appleby. In the mainstream press, a media narrative that was generally sympathetic to Palin’s view that she had been unfairly blamed for the Tucson violence seemed to change after the video’s release. Amid the many storylines that emerged in the past week, one was notable mostly for its absence. While some lawmakers talked about new legislation, the issue of gun control generated only modest coverage. In the mainstream press, the gun control storyline accounted for only 5% of all the Tucson coverage studied from January 10-16—garnering about one-fifth the attention the political rhetoric issue generated. In the online media analysis, the numbers were strikingly similar. 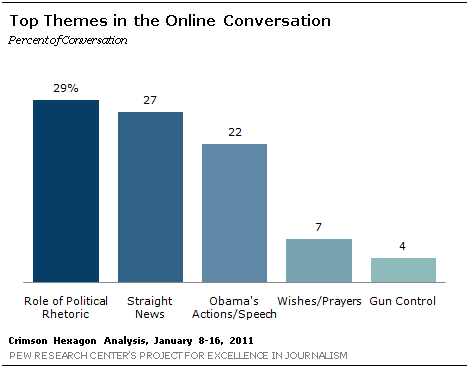 Only 4% of the conversation about the shootings on Twitter and blogs was related to gun control. A day-by-day breakdown of both social and traditional media coverage reveals that the gun control debate never had a real spike, never exceeding 7% of the shootings newshole on any given day. And last weekend on “Meet the Press” Democratic Senator Chuck Schumer said: "Let’s be honest here. There haven’t been the votes in the Congress for gun control. We have had some victories … But make no mistake about it: The changes are hard." No other story in the mainstream media came remotely close to matching the level of coverage devoted to the Arizona shootings last week. And much of the rest of the news agenda was devoted to natural disasters and dangerous weather. The No. 2 story, at 5% of the newshole, was the winter storm that blasted through the South and Northeast. It was followed closely by coverage of the economy, which dipped last week to 5% from 10% the previous week. The No. 4 story was the aftermath of the Haiti earthquake, (4%), which hit the one-year anniversary mark last week. And the fifth-biggest story was about another natural disaster, the Australia flooding, at 3% of the newshole.